Forte Notation is happy to offer special discounts for schools, teachers and students! Get full access to FORTE 10 PREMIUM, our premier edition notation software system with full-functionality for your organization TODAY! ​Musicians inspire people. As musicians ourselves, we understand that you are passionate about sharing the wonders of music with your students. We also understand it is difficult enough to fund a music that offers the bare minimum. We want to help your educators share their passion with the next generation, and fuel the student’s passion for music. The education system is difficult, expensive and complicated but it doesn’t have to be when it comes to music notation software. Just think of how excited your teachers and students will be, and how much your ​classes will benefit from FORTE Notation! For these reasons we are happy to extend a special discount for our FORTE 10 PREMIUM EDUCATION edition to your school. We want to help you and your teachers to help your students. The doors to the beautiful world of music are now open! for your personal and professional use. ​Order your academic license package via email ​on the "Contact us!" button. In order to benefit from the academic license, an appropriate proof is required. Do you need a different package from the ones offered? Write us a message! Special discount offer for STUDENTS ONLY! Music is your passion. Unfortunately scoring can be very frustrating and time-consuming if you’re not using great software. 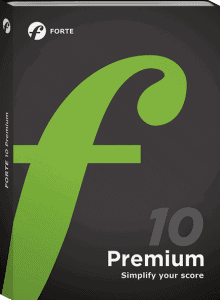 FORTE 10 PREMIUM is perfect for students! This software is easy to learn, easy to use and best of all… budget-friendly! ​We ​understand that you're having student pockets and therefore we are offering a special student license discount. We want to you to be able to share your scores with the world, and FORTE 10 PREMIUM will allow you to create, enjoy and share your musical creativity.